Winter is here. Time to pack away your shorts, flip-flops and bathing suits and make room for oversized jackets, boots and lip balm—lots and lots of lip balm. That dry crisp winter air can leave your skin feeling chapped, dehydrated and flaky—an annoying side effect of an otherwise nostalgically joyful season. But never fear, here is a list of dos and don’ts that will leave your skin looking radiant this winter season. Drink a lot of water. Your skin is your largest organ, and just like any other organ in your body, the cells are made up of water. When you are not getting enough water, your skin will become dehydrated, because the water you do drink travels to all other organs first before it even reaches your skin. So drink up! Choose the right cleanser. Washing your face twice daily with a good moisturizing cleanser will prevent your skin from drying out. At Tamara’s Skin Care we carry Image Vital C Hydrating Facial Cleanser because incorporates nourishing anti-oxidants and Vitamin C to gently clean, repair and sooth. Moisturize daily. Apply an SPF moisturizer in the morning and a hydrating crème before you go to bed. At Tamara’s, we carry Vital C Hydrating Repair Creme, Prevention + Daily Hydrating Moisturizer with SPF 30+ as well as Image Body Spa Rejuvenating Body Lotion. These are a well-balanced trio to keep not just your face, but entire body looking radiant. Use a humidifier. The drastic change from dry heat used to warm your home, and the cold outside air, will cause your skin to dry out faster. Using a humidifier will allow you to stay warm and retain your skin’s moisture. Take hot showers. Even though a long relaxing shower seems like the best idea on a cold day, your skin will not thank you for it. Your body produces a thin layer of oil to protect the skin and help retain moisture. The hot water causes that oil barrier to soften, allowing moisture to escape, and leaving your skin vulnerable to harsh environmental elements. Use bar soap. As mentioned above, the skin is covered in a thin layer of oil, and bar soap will only strip the barrier leaving your skin irritated and dry. Instead of bar soap, use a body cleanser designed to gently exfoliate and moisturize such as the Image Body Spa Exfoliating Body Scrub. Rub your skin dry. When you get out of the shower, gently pat your skin with a towel. Rubbing will only cause irritation or exasperate other skin conditions such as eczema. 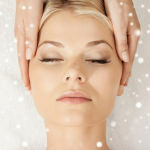 ← Oxygen Facial – What Is It?